Prep time: 1 hr. Cook time 20 min. Trim excess fat from 1/2 lb. 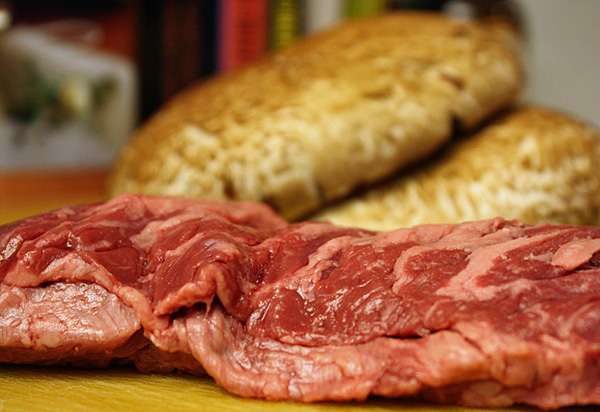 of skirt steak and use a damp cloth to clean off 1 portabello mushroom cap. 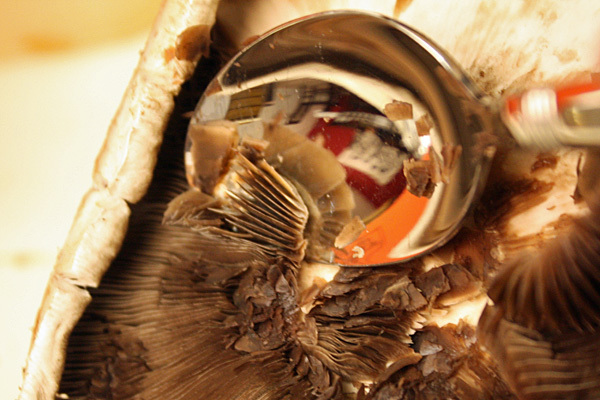 Remove the stem from the underside of the mushroom and use a spoon to gently scoop out the gills. I had never done this before, but Chef Brian said it’s done because the gills are bitter. 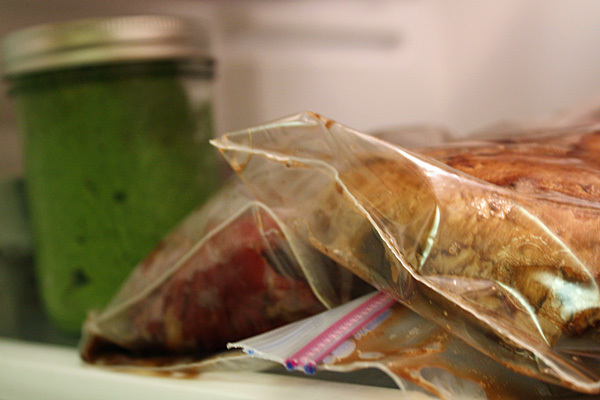 Place the skirt steak and mushroom in separate Ziploc bags with 1 clove of smashed garlic in each bag. Split 1/4 cup of balsamic vinegar between the two bags. Place bags in the fridge and marinate for 1 hour. 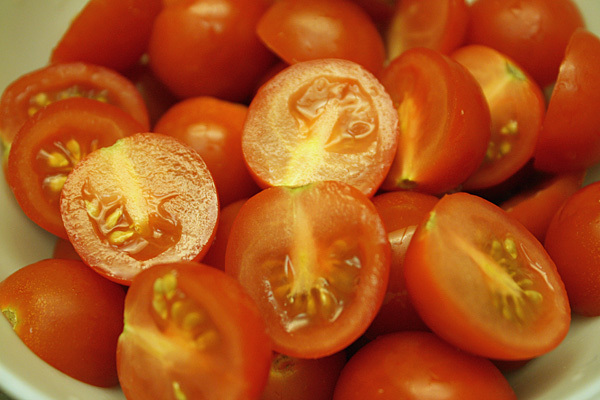 Let about 40 minutes pass and then head back to the kitchen and cut 1/2 pint of cherry tomatoes in half. 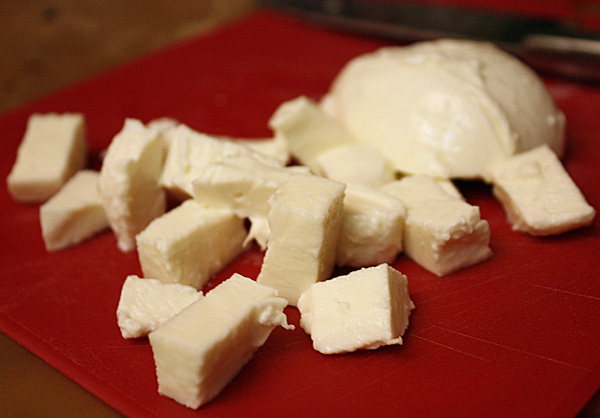 Take 1 ball of ovaline mozzarella (ovaline signifies the shape of the mozz ball) and cut into a medium dice. 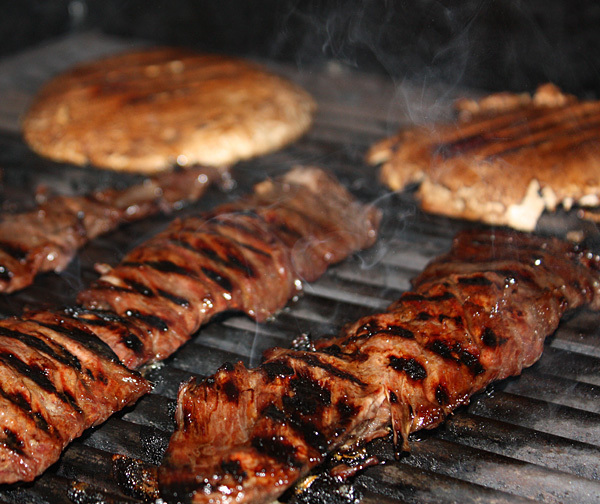 When you’re done, take a minute to preheat your grill to medium-high for the steak and mushroom. 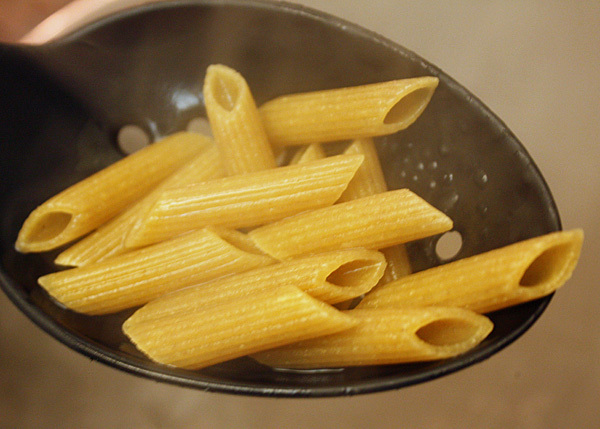 Boil 2 servings of whole wheat pasta for 10-12 minutes. I find the whole wheat stuff needs to cook just a bit longer so mine went down for the full 12 minutes. Drop the beef and mushroom on the grill. I cooked both for about 5 minutes per side. Once the steak is cooked, let it rest for 3 minutes and then cut the strips, along the grain, into squares or rectangles depending on how long your skirt steak is. Then, slice those squares against the grain. This ensures the final pieces will be tender. Slice the mushrooms into strips of equal size as the beef. 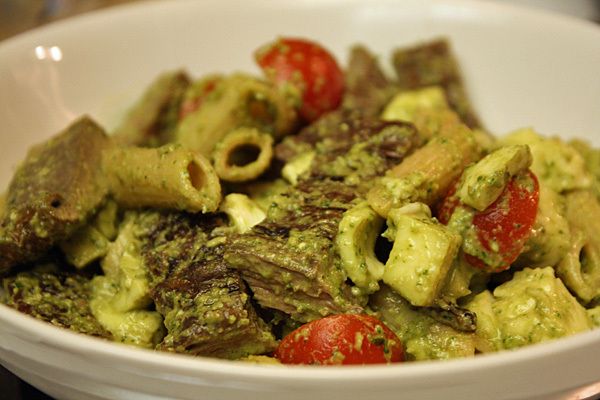 Combine pasta, tomatoes, cheese, beef and mushroom in a bowl with 3 T of pesto sauce and toss until pesto is distributed evenly. To plate: Split the portion between two bowls and dig in! I didn’t know balsamic would pair so well with beef, but the strong vinegar rounded out the flavor of the meat, and the sharpest notes in the balsamic were toned down by the succulent fat in the tender skirt steak. The mushrooms help to “beef up” the dish without adding the extra calories from more steak. 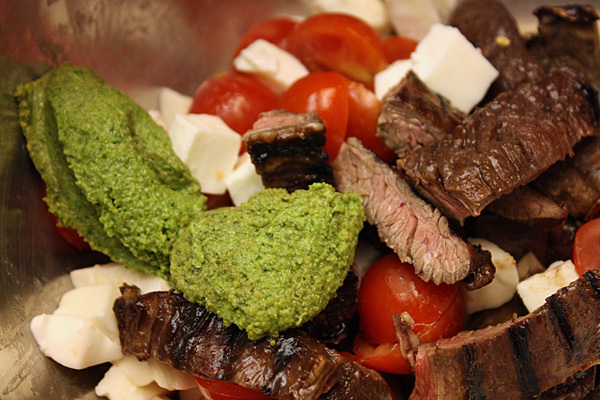 The pesto-coated tomatoes and mozzarella cubes are heavenly. This was a quick one, and one I’ll likely go back to often considering its simplicity and multi-dimensional flavor.